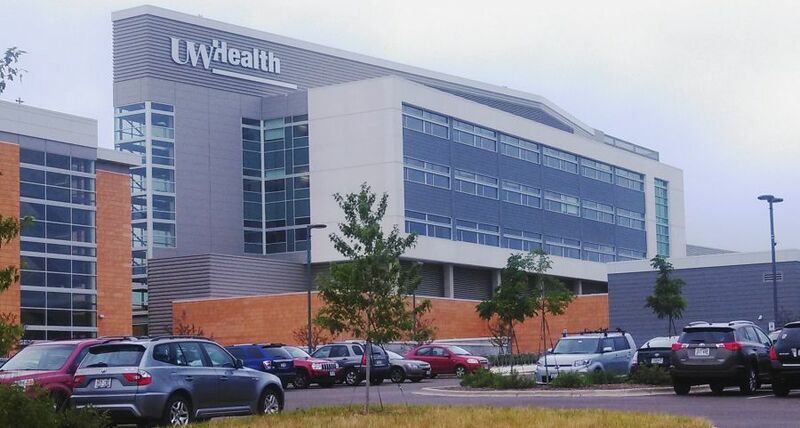 This week UW Health is celebrating the grand opening of its new, 496,000 square foot American Center on Madison’s far northeast side. It’s a celebration years in the making – and not just for hospital staff. “I’ve been working on it since September of 2013,” says Madison Water Utility project engineer Kelly Miess, who was tasked with enormous job of making sure there would be enough water to support the development. And it wasn’t just the new hospital that was a concern. So Madison Water Utility worked for the past two years to complete three major projects ahead of the American Center opening. Crews drilled a tunnel and ran water main beneath Highway 151 (see the video below), and completed a large main underneath Interstate 39/90. But that was just the beginning. The utility met the challenge by upgrading its northeast side booster pumping station, a project completed just weeks ago. “Now there are four pumps total, two of them serve the low zone, two of them serve the new high zone,” Miess says, adding that upgrading the booster station also allowed the utility to increase water pressure for the nearby Bunker Hill neighborhood, which had experienced chronic low pressure for years. The three projects cost a total of $3.5 million, and took hundreds of hours of planning and coordination. Larson insists the investment in water infrastructure on the northeast side is about much more than one hospital or one collection of business parks.